This week: Four games, four champs… will Kathy stem the tide? She might need a bit of help. Good work by H.B. heading to the $400 clue at the end instead of the $2,000 – kept his lead securely in his grasp. If Kathy doubles her score, she’ll have 23,200. To cover this all-in wager, H.B. will need to wager 10,600. An incorrect response with that wager will leave H.B. with 2,000. To stay above his total, Kathy can wager up to 9,600. Rob can wager up to 5,700. A successful doubling will put Rob at 15,400. To cover this, Kathy should wager at least 3,800. Rob would need to wager at least 100 against Kathy. Just in case, we’ll also say he needs to wager 2,100 against H.B. If Kathy makes the rational maximum wager of 9,600, H.B. will need to wager 8,600 to cover her. They’re too close to make this a feasible play, though, but we can tighten up the others’ ranges. He’ll be left with 4,000. To stay above him, Kathy can wager up to 7,600, and Rob may risk up to 3,700. If Rob goes for 5,700, Kathy could cover him with 1,800. If H.B.’s 2,800 was questionable, 800 is even more so. An incorrect response with that wager will leave Kathy with 9,800. Again, I’m unconcerned about H.B. 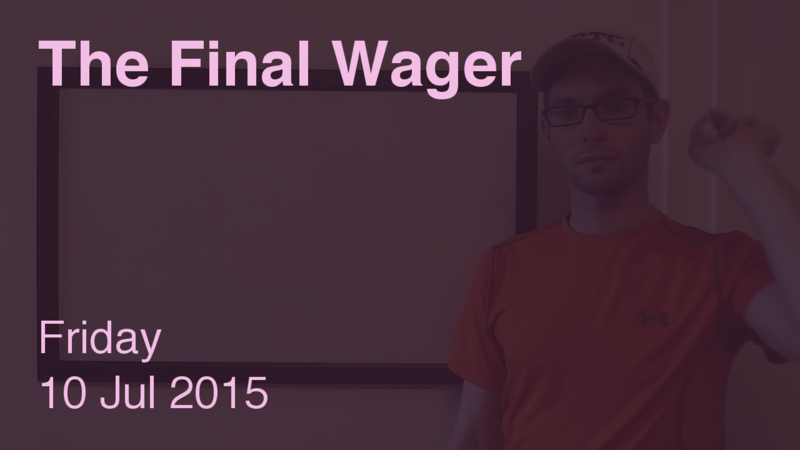 wagering 800. Great job, everyone! I can head into this weekend with a smile on my face.